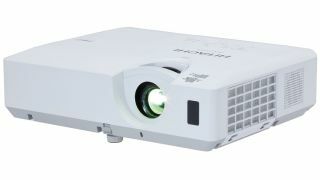 The CP-X25LWN projector has XGA 1024 x 768 resolution, 5000:1 contrast ratio, 10,000 hour lamp life combined with Hitachi Accentualizer, HDCR (High Dynamic Contrast Ratio), Image Optimizer Technology and energy saving ImageCare Technology which makes it an ideal solution for classrooms and conference rooms. Coupled with the extended five-year/10,000 hour lamp warranty, the CP-X25LWN provides peace of mind and a significant return on investment for end-users. The CP-X25LWN is equipped with two HDMI inputs, x 1.2 manual zoom lens, 10,000-hour Hybrid filter, 16-watt audio output, network control/maintenance/security, PJMessenger, wireless network option and the ability to present content via LAN. The CP-X25LWN was reviewed by Projector Central and given the Road Test Certified designation. For more information on Hitachi projectors, visit www.hitachi-america.us/projectors.